Do White Papers Still Matter? Why White Papers Still Matter: Their Role in Effective Content Marketing is a good read – it’s got a lot of great information about why white papers are a great content marketing tactic. One take-away is this: The point of view you isolate for the pillar, or central idea of your white paper will differentiate your company in the eyes of your readers. Your readers must see value in learning about your point of view. But finding that point of view, and orchestrating the development of a white paper just may be easier said than done. If you agree, you may find yourself wondering how or where to begin crafting a white paper for your organization. Read The White Paper: Guidance For Creating This Coveted Content to put yourself on the right track. It includes a checklist to help you understand how to proactively prepare for the development of a white paper. Need more inspiration? We’re happy to share a couple of white papers we recently created and published as part of a client’s content marketing program. 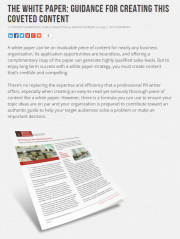 Request your PDF copies of these white paper samples.